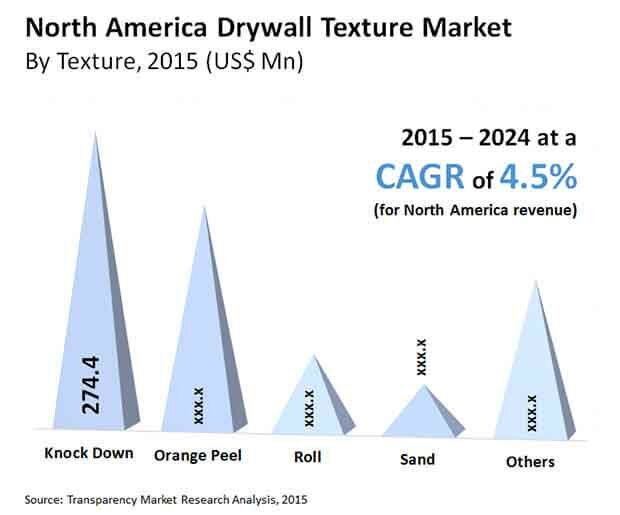 The North America drywall textures market displays a fragmented competitive landscape with top three companies, namely USG Corporation, The Sherwin-Williams Company, and PPG Corporation holding less than 33% of the market in 2015, notes Transparency Market Research. Top players in the market are focused on expanding their product portfolio and their geographical presence as a way to accelerate growth in the drywall textures market in North America. A case in point is The Sherwin-Williams Company. The company added 13 new outlets in Argentina, 47 in Mexico, and 11 in Brazil to build strong presence across the Americas. The drywall textures market in North America stood at US$771.9 mn in 2016. Displaying a CAGR of 4.5% between 2015 and 2024, the market is expected to reach a valuation of US$1.09 bn by 2024. In terms of product, fire-resistant drywall and regular firewall collectively held more than 50% of the market in 2015. Currently, regular drywall leads the market with the segment holding a significant share of the market in the recent past as well. In particular, the U.S. has been exhibiting considerably high demand for regular drywall in the past and this product segment is expected to display a steady growth rate in the future as well. The growth of fire-resistant drywall product segment is due to the implementation of local building codes for residential spaces in North America. As a result, the installation of fire-rated drywall on exterior and interior walls near utility rooms and furnaces has become mandatory. By texture, orange peel and knockdown collectively held 65% of the North America market in 2015. The segment of knockdown textures is expected to generate a handsome revenue as they are gaining popularity across several towns and cities in the U.S. In terms of mud, topping joint compounds holds the leading share in the North America market for drywall textures. While residential is the leading end use segment of the market, walls form the leading application segment of this market. By volume, the U.S. leads the drywall textures market followed by Canada. The U.S. held 75% of the overall market in 2015 and is expected to display steadfast growth owing to the increasing demand for drywall textures in building and construction applications. “In the U.S., higher existing house sales and appreciation of home process are the major factors having a positive influence on the North America drywall textures market,” says the author of the study. TMR reports that in the U.S. the average price of homes appreciated by 8% in 2015 and by 24% in the last five years. The home appreciation trend has been more evident in places where real estate prices are generally high. On the flip side, shifting preference of individuals for rental homes in place of self-owned homes is reducing the demand for drywall textures. Moreover, lower household mobility has led to the reduced demand for drywall textures, thereby hampering the market’s growth. Nevertheless, the presence of millennials in the rental market is anticipated to encourage property owners to invest in home improvement pursuits.